Manulife US REIT (SGX:BTOU), with its 7 freehold US office assets backed by high-quality tenancies, remains a good proxy for favourable US macro-economic fundamentals, in our view. a diversified 116-strong tenant base. Manulife US REIT offers 6.9-7.1% FY19-20E DPU yields vs 4.6-6.6% promised by its office S-REIT peers. We initiate coverage with BUY and a DDM-based Target Price of USD1.00 (COE: 7.7%, LTG: 2.0%). a slower US office sector outlook. Manulife US REIT owns 7 freehold office properties in 6 US cities with strong demand-growth fundamentals. Portfolio occupancy averaged 96.7% as at end-Dec 2018. We expect occupancy to be well-supported by limited new supply in its micro-markets in 2019-20. This is against a backdrop of firm US economic fundamentals, where strong employment growth boosted net absorption of office space by 82% q-o-q in 4Q18 to a 3-year high. Matching new supply kept vacancies stable at 13.2%, according to Cushman & Wakefield. Manulife US REIT's DPU visibility is backed by its favourable lease structure, with about 94% of its leases by gross rental income having built-in rental escalations. Rents for 55% of these leases will increase by an average of 2.5% pa, with another 39% set for mid-term or period rental increases. WALE is 5.8 years by NLA with 60.7% of its leases by NLA expiring from 2023. Manulife US REIT's WALE is longer than the typical 3-4 years for Singapore offices; it is in fact one of the longest among S-REITs. Lease expiries are spread out, with minimal expiries due in 2019 and 2020. Excluding Hyundai’s lease at Michelson which was renewed in Jan 2019, only 5.5% is due for renewal in 2019. We expect rental reversions of 8%. Most of Manulife US REIT’s assets, with the exception of Michelson, are under-rented at 5-10% below market rents. Its sponsor operates a fully-integrated real-estate management platform which holds USD17.8b in real-estate AUM globally. About USD8.8b is located in the US. Swift AUM growth with 93 properties worth USD7.2b acquired since 2010 offers Manulife US REIT access to a strong deal pipeline, especially of office buildings in the US. Manulife US REIT in Dec 2018 announced that it expected to maintain its tax structure, based on proposed US S267A regulations. It is also exploring the possibility of reverting to its original IPO tax structure. This would exempt it from requirements for its Barbados entities, after confirmed regulations are released by 1H19. The result could be 1.5% in tax savings and upside for our DPU forecasts. Manulife US REIT trades at 6.9-7.1% FY19-20E DPU yields vs its office S-REIT peers’ 4.6-6.6% and other US-listed REITs’ 3.7-3.9%, while offering high DPU visibility. At our Target Price, Manulife US REIT would trade at a 6.0% yield, about 3.5% above that of the 10-year US government bond. 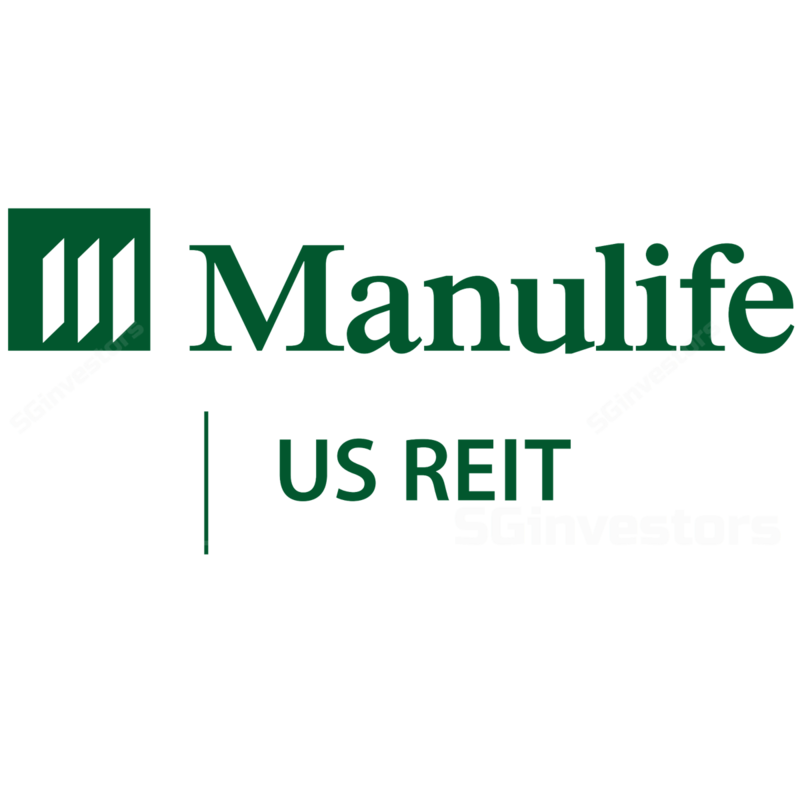 Refer to the attached PDF report for information on Manulife US REIT's portfolio, details on leases & tenancies structure and also Manulife US REIT’s sponsor the Manufacturers Life Insurance Company (Manulife)'s acquisition pipeline. An acceleration in the US economy in 2018, helped by tax cuts, rising optimism and synchronized global growth, resulted in faster job growth and demand for office space. Absorption increased with the technology sector dominating growth in new leasing demand, according to Cushman & Wakefield (C&W). The impact of stronger demand growth was however balanced off by rising new construction - 52.7m sf of additional office space was completed in 2018, the fourth consecutive year completions rose above 50.0m sf. C&W further expects this supply pipeline to increase to a high of 114.0m sf in 2019, but that overall vacancy should remain flat against continuing job growth, with balanced growth in both office supply and demand from employment growth. The US economy added 762,000 net new nonfarm payroll jobs in 4Q 2018, the highest quarterly job gains for the year. Strong employment growth led to an increase in net absorption (net change in occupied space), which jumped q-o-q from 11.0m sf to 20.0m sf in 4Q 2018, the highest level since 4Q 2015. Meanwhile, 13.7m sf of new office space was completed and delivered to the market, up q-o-q from 9.8m sf in 3Q 2018. As demand exceeded new supply, office vacancies declined q-o-q from 13.4%, while it rose slightly y-o-y from 13.1% to 13.2% in 4Q 2018. Since 1Q 2016, vacancies have remained stable at between 13.1% to 13.4%, as absorption has balanced off the construction completions - a total of 159.4m sf was completed and 157.2m sf absorbed during the past three years. The increase in US office space against a rise in construction completions - 114.2m sf was under construction at end 2018, up from 103.0m sf at end 2017 – would represent the highest volume in the market’s current cycle at 2.1% of the total US inventory, but the bulk of new construction is in cities and markets with strong leasing demand. As such, the 15 markets with the highest volume of space under construction - accounting for 66.7m sf or 58.3% of US construction pipeline at end 2018 - were also among the strongest markets, contributing 29.5m sf or 54.8% of net absorption during 2018. New office leasing volume totalled 74.7m sf in 4Q 2018, up y-o-y from 73.4m sf in 4Q 2017, but down q-o-q from 80.2m sf. The technology sector contributed 34.4% of total new leasing volumes, ahead of the financial services sector’s 18.8% share, and the real estate sector’s 5.6% - the latter was led by the rapid expansion of co-working players. Technology sector leases accounted for 29.3% of activity in 2018, followed by financial services at 20.7% and real estate at 6.3%, according to C&W. As such, US cities with strong technology sectors boasted the highest leasing volumes. Average asking rents rose to a record USD31.45 psf in 4Q 2018 (+2.2% y-o-y); this was the smallest y-o-y rise since 2014 when rents rose 2.0% y-o-y. 50 markets (out of 87) recorded q-o-q increases in asking rents, the smallest number since 1Q 2018, according to C&W. The US market continues to offer depth in terms of yield-accretive assets. While interest rates climbed steadily to 2.5%, there remains a substantial yield-spread to cap rates for Class A CBD and suburban office properties at between 5.25% and 8.5%, according to CBRE. See attached PDF report for Manulife US REIT's detailed financial analysis. We look at office S-REITs as a possible comparison, given the similar asset class - they trade on average at 5.6% 2019-2020E dividend yields, and 0.9x P/BV. While being a similar asset class, there is a substantial difference in the fundamental outlooks for the Singapore and US office markets. We estimate the strong US office market should see DPU for Manulife US REIT grow 3% from FY19-20E, while DPU for its Singapore counterparts is likely be flat, following the 15% rally in Grade A office rents in 2018. We expect Manulife US REIT to trade at a slight discount to its peers despite the stronger DPU growth, with an implied FY19E dividend yield of 6.0% at our Target Price, given its foreign assets’ listing status. We believe this valuation is reasonable as S-REITs with offshore assets trade at about 25-50bps wider than their onshore counterparts, with this discount owing to Singapore investors’ lesser familiarity with the asset classes. See attached PDF report for DDM valuation details. We also compare Manulife US REIT to other US office REITs given similar underlying exposures. US office REITs trade at 3.9% 2019E and 3.7% 2020E dividend yields, representing a 120-140bps spread to the 10-year US government bond yield of 2.54%, and 2.1x P/BV. There is an accounting difference between S-REITs and US REITs, as US REITs are required to depreciate assets (buildings) and amortize various non-cash expenses, while S-REITs report on a cash-basis. In our view, the adjusted funds from operations (AFFO) yield could therefore provide a better comparison. We estimate our Target Price implies a FY19-20E (AFFO) yield of 4.3%/4.6% for Manulife US REIT, 70-90bps wider than the average for US office REITs, given the much smaller size of its portfolio and its slightly different geographic exposure (most US REITs have larger exposures to East Coast cities). We have applied a beta of 0.65x in our valuation model. This is close to the midpoint of the 0.61x beta average for the Singapore office S-REITs, which range from 0.44-0.70x and the 0.73x beta average for the US-listed office REITs, which range from 0.59-0.89x. See attached PDF report for detailed comparison between Manulife US REIT and Keppel-KBS US REIT (SGX:CMOU), and also the S-REIT peer comparison table.